Have you found an online vendor selling Plantation Belize XO Single Cask Pineau des Charentes Finish? Not too many rum from Belize available around here. In Quebec where the state own SAQ runs the show, I'm quite sure only Plantation offers us some rums from this small Central America country. This Single cask triple ageing limited edition (ouf!) was released last year and has become back order locally a few months ago. Tasted a few times, this is quite voluptuous. Not sure if Belize, like neighbouring Guatemala, also produces their rum from sugar cane honey (evaporated vesou/ sugar cane juice) instead of molasses, but the result is a medium body, round mouth feel with some distinctive butterscotch and nuts aromas. It basically tastes like Cracker Jack, with some subtle vegetable even garden like notes (pumpkin) that must be originating from the Pineau des Charentes cask finish. Although at 41° it shows some character and has some sweet finish like some of the Plantation Line. It shows some spiciness and some tropical fruit notes. A great easy going rhum to start your rum tasting night! Som altid er det en oplevelse af de gode med Plantation men denne X.O. Er nu super god. A trully fantastic rum. Great aroma, great aftertaste, long finish, very frutty! I like this rum a lot. Not quite abuelo centario or zacapa xo but not as expensive either. Interesting wine to choose for barrel storage, but it works really well. In der Nase dezente Noten von kandierten Früchten und leicht rauchig getoastetem Holz. Im Gaumen ein angenehm warmes Mundgefühl, sehr elegant, sehr schön ausgewogen. Karamell, dunkle Schokolade, Gewürze und Holz sind die dominanten Aromen. In the nose, subtle notes of candied fruit and slightly smoky toasted wood. On the palate a pleasantly warm mouthfeel, very elegant, very well balanced. Caramel, dark chocolate, spices and wood are the dominant flavors. Oak and plum in the nose. Oak and a lot of burning alcool in the mouth. The aftertaste is too tiny, but not too bad. A rum still looking for its equilibrium. Maybe just a little bit too young? Jeg syns den var ok til at State med. Så har jeg haft den i en karafle i et års tid. Så er den bare super god. Kukus og sommer. This rum had so much smell and taste. A lot to offer if you just give it some time in the glass. A must try if you get the chance. A good rum, a fantastic rum if you like coconut flavour. Medium sweetness and could have more "body" finishes quite quick. My rating is due to I'm not really in to so much coconut taste. Jedná se o víno fortifikované, tedy dolihované, obdobně jako například portské. Jde o regionální francouzský aperitiv, vyrobený v departementech Charente a Charente-Maritime. Jeho historie sahá až do roku 1589. Vyrábí se buď z čerstvé, nekvašené hroznové šťávy nebo směsi lehce zkvašeného hroznového moštu , ke kterému se přidá koňak a pak se nechá zrát. Sud číslo 4/14. Láhev 145/450. Shrnutí: Poprvé jsem ho ochutnal na červnové akci s josém v Hořicích, využili jsme toho, že nám připomněl Plantation XO 20th Anniversary a že josé ho měl doma otevřený a udělali jsme i přímé srovnání, které tento dojem jasně potvrdilo. Anniversary je ale jemnější a víc inklinuje ke koňaku, Belize je hutnější, výraznější a pikantnější. Pro mě výborný rum, Plantation opět potvrdil svou vysokou kvalitu. Na zmíněné degustaci se v součtu umístil na 1. místě před 15 yo Pusser's Nelson's Blood a Ron Zacapa XO. Od té doby jsem přechutnával ještě několikrát a líbí se mi stále víc. Velká spokojenost s nákupem. excellent rhum, dans la continuité des Plantation, une valeur u-sure. I'm a huge fan of the Plantation rums, finding them to be not only among the best values in the business but also among the best tasting (to my palette, of course). The Belize is no exception. 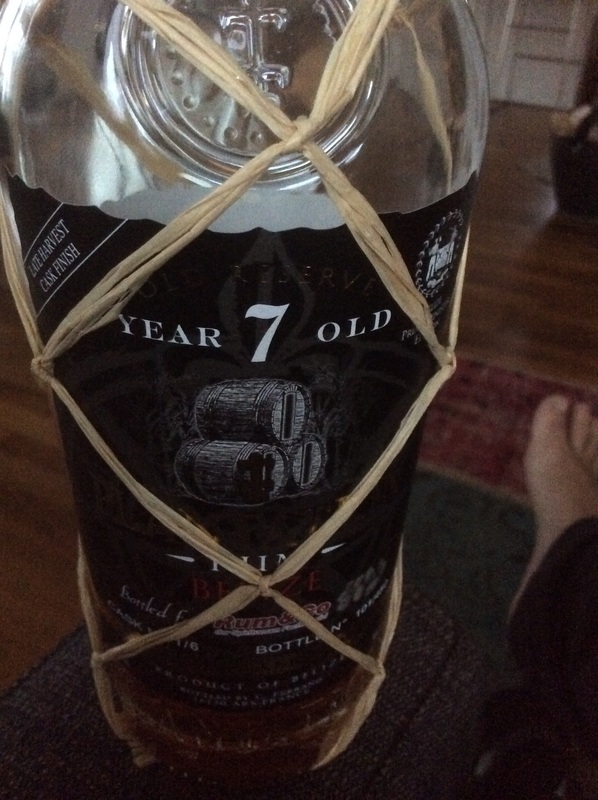 I was especially taken by the ever-so-slightly smoky nose on this rum along with its unique flavor profile clearly brought about by its unique single-cask finish. The flavors I'm used to tasting seemed to have a new edge in this expression - less overt sweetness, perhaps a vegetal "rounding" or maturing. Lovely! Recht würzig und scharf, nicht sehr süss, der Alkoholgeschmack steht leider zu fest im Vordergrund. Der Rum ist pur oder mit einem Eiswürfel gut geniessbar, jedoch gibt es in dieser Preisklasse viel bessere Rumsorten als dieser Plantation.